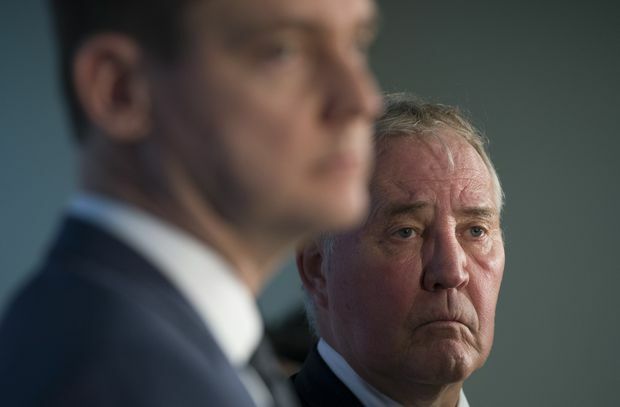 Federal Minister of Border Security and Organized Crime Reduction, Bill Blair, and British Columbia Attorney General, David Eby, are seen during a news conference in Vancouver, on Jan. 22, 2019. The federal government’s Minister of Organized Crime Reduction, Bill Blair, was in B.C. this week, and no doubt got an earful on a subject increasingly garnering ugly headlines in the province: money laundering. Most of the country knows what an easy mark British Columbia has become for international crime syndicates looking to wash their drug money through legitimate channels. And the province’s casinos, as well as the real estate, automobile and horse-racing industries have apparently been the chief conduits. But the problem, it turns out, may be far bigger than previously imagined. A report on the matter commissioned by the NDP government and released last June suggested as much as $100-million in dirty money was being tidied up at the cash windows of local casinos, among other places. It turns out that Peter German, a former deputy commissioner in the RCMP and the report’s author, was a little off in his estimation. Try a possible 10 times the amount of money being laundered in the province annually. Or even more. That’s the figure that emerged recently in confidential RCMP studies, obtained by Global News, indicating crime networks are laundering billions through high-end Vancouver real estate. An underground banking operation that has been the subject of a police investigation is also estimated to be laundering more than $1-billion a year, according to an international intelligence report the news organization obtained. That provincial Attorney-General David Eby had to learn about this through the news media is appalling. Parallel operations have been looking into money laundering concerns in B.C. stretching back years. The province had an investigative unit examining the issue, as did the RCMP. More than a year ago, Mr. Eby set Mr. German loose to gather fresh information on the extent of the problem, while the RCMP, in conjunction with other worldwide intelligence authorities, continued to do its thing. Which seems like a pretty dumb way to conduct business. This was, in part, the purpose of Mr. Eby’s meeting with Mr. Blair this week. They emerged from their confab assuring the public that co-operation will be greater in the future. There was a promise that Mr. German would have access to any information the RCMP had that was relevant to his continuing investigations. Which all sounds good and fine. But another major hurdle still exists: There are not enough resources to tackle this growing criminal problem. For every big money-laundering operation police focus on now, a plethora of others are almost certainly carrying on without scrutiny. Mr. Eby has been saying for some time that there is insufficient investigative capacity to truly have an impact on criminal operations in Canada, and not nearly enough person-power to successfully prosecute and convict these criminals. To add insult to injury, a major police probe that sought the prosecution of two people accused of being behind a major underground banking operation crashed and burned late last year. Turns out, federal prosecutors accidentally exposed the identity of a key police informant. Had the case proceeded to trial, the person’s life would have been put in jeopardy. What was believed to be the largest money laundering investigation in the country’s history went spinning down the drain because of a careless mistake. Meantime, it remains extremely difficult to prosecute the kind of sophisticated criminals that are on the make in B.C. and elsewhere in Canada. Police have complained about disclosure regulations and trial time limits that give defence lawyers and the international syndicates they represent a distinct edge. Yet, little changes. The chorus demanding a public inquiry into money laundering grows louder by the day. People are angry over how this matter has been ignored by previous provincial administrations, which in turn allowed it to proliferate. Upset citizens want heads to roll. Mr. Eby has been reluctant to take this path, saying that a probe of the magnitude of Quebec’s Charbonneau Commission, for instance, could compromise current police investigations. But, Charbonneau lifted the lid on corruption in that province’s construction industry while related police probes were continued. It had no impact on their outcome or integrity. Calls to examine the extent to which certain people willfully ignored the money-laundering problem in B.C. may become too noisy to ignore.